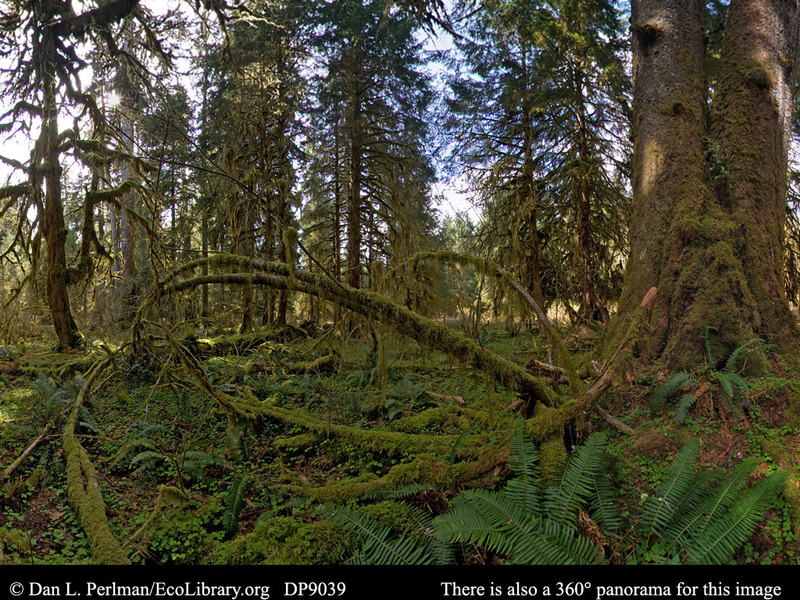 You may want to discuss with your students the nutrient cycling going on in this old-growth forest. As the giant conifers die and fall down, their tons of biomass become slowly available to the other inhabitants of the ecosystem as detritivores and decomposers slowly break down the dead plants. Consider, too, the different microhabitats found in this ecosystem: the forest floor, the surface of downed trees, tree branches and trunks -- small plants and animals have a wide array of microclimates and microhabitats available to them. Temperate rainforests occur very few places on the planet, and a narrow strip of the Pacific coast of North America is the best area to see this remarkable ecosystem type. The Hoh River Valley is reported to receive about 3.5-4m (12-14ft) of rainfall per year, which creates a forest dripping with epiphytes (plants that grow on other plants), as seen here. In addition, some of these North American temperate rainforests are thought to contain more biomass per unit area than any other terrestrial ecosystem, although the diversity of species found here is just a small fraction of a tropical rainforest. Just to the right of the large double-trunked Sitka spruce you can see a slowly decaying "nurse log" that supports several young trees that began life as seedlings on the log.